The iManager App for iPhone and iPad, is a extension to the iDevice Manager. With the installation of the iManager on your iPhone or iPad, can you transfer new person contacts from the Windows computer to your iDevice. Also can you transfer images (JPG and PNG files) and MOV and MP4 videos from your PC to the Apple mobile device like iPad and iPhone. With the installation of the iManager App and the buying of a Pro-Edition license, will be change the iDevice Manager to the iDevice Manager Pro-Edition. The Pro-Edition as no limits for downloading of any data from iPhone to your Windows PC and the export function of contacts, SMS, WhatsApp and more is available. The software is available without restriction. The iManager App is for the data transfer between iDevice Manager and the Apple iPhone or iPad. By installing the iDevice Manager on a Windows PC, you get a tool for reading and exporting data's from iPhone and Co. to a Windows computer. You can find an elaborated program description at the iDevice Manager page. With By additionally installing the free iManager App on iPhone or iPad, can you also transfer photos, videos and contacts from the computer to the iPhone. If our free iManager app is already installed on iPhone / iPad and connected to the iDevice Manager via Wi-Fi, is it possible to edit or add contacts to your Apple device. When you save the changes, it will be automatically transferred to the iPhone Addressbook. Alternatively, can you transfer large amounts of Google, Apple or Outlook contacts in the form of vCard files via drag 'n drop. Many users wished to transfer pictures, photos and other images from PC to iPad without iTunes. If you installed the iManager App on your iPhone or iPad, you can easily transfer holiday pictures in HEIF or JPG format or send fun-videos or YouTube-videos as HEVC, MP4 or MOV file. All data are transferred directly from the iDevice Manager to the iManager App in your local private network. No data gets to the Internet or other devices. Therefore, a very high and fast and secure data transmission is possible. 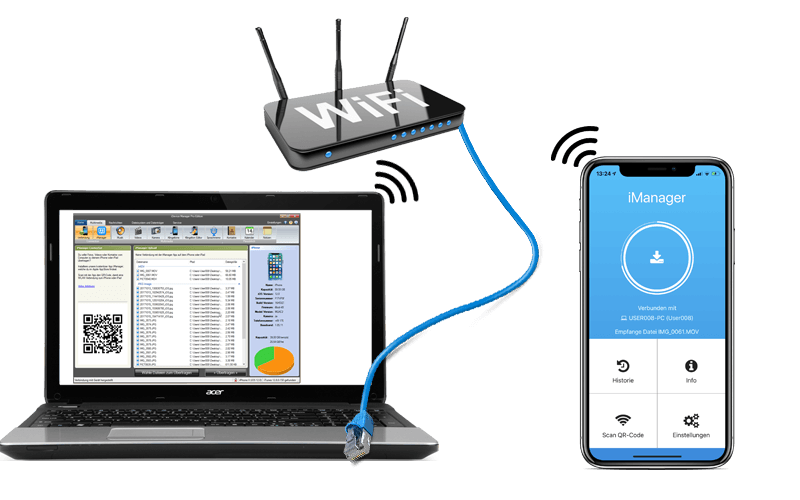 To transfer files from Windows Computer to the iPhone or iPad in your local network, is a TCP port release in the Windows Defender Firewall, Norton Internet Security, Kaspersky Internet Security, Avira, etc. necessary to allow the data transfer. The iDevice Manager creates the required security rules already during the installation in the Windows Defender Firewall. For other products this may need to be added manually. The following inbound and outbound rules must be applied to the program iDevice Manager.